The power of satellite geodesy was quickly evident, and significant results were forthcoming almost as soon as the satellites were available. Nevertheless, the first half-dozen years after Sputnik must be regarded more as a preparation period rather than as a full flowering of the new technique. One obtained a better estimate of the size and shape of the reference ellipsoid to use for a world geodetic system, and a good start on tying a number of existing networks together by using satellite triangulation. But most of the work of establishing a worldwide system had yet to be done. Accuracies measured in meters were achieved in the early work, but these were far from the precision for which one could foresee a need and of which the satellite approach ought to be capable eventually. For some applications to oceanography, such as the determination of circulations and their causes, measurement of heights of the sea surface (which is not always at mean sea level) would be required to within centimeters, and correspondingly the altitudes of orbiting satellites to a comparable precision. To follow the motions of tectonic plates making up the earth's crust, and the drifting of continents-a few to perhaps 10 centimeters a year-comparable accuracy would be needed. The military services also had  requirements for greater accuracy in geodetic measurements, not so much in the positioning of strategic locations around the world relative to each other as in the determination of higher order harmonics of the earth's gravitational field, which would affect the orbits of navigation and photographic satellites and the accuracy of long-range missiles. And the precise determination of the earth's field was of major scientific interest, being directly related to the structure and processes within the earth's crust and mantle, which in turn were probably connected with the causes of tectonic plate motions and continental drift. To obtain the great precision needed for such applications, many years of theoretical work and practical experience with the new geodetic techniques still lay ahead. The power of satellite geodesy for gravitational field studies lay in the different avenue of approach it afforded from that of ground-based geodesy. For example, to locate the geoid from surface observations one might start with measurements of the deflection of the vertical from the normal to the reference ellipsoid. But the normal to the geoid surface (fig. 43), which is the direction of gravity at the point in question, usually differs from the direction of the perpendicular to the surface of the reference ellipsoid. The deviation is determined by astronomical measurements, using the stars as a fixed reference system in space. From the angle between the normals to the geoid and the reference ellipsoid at a chosen point, one can deduce for any direction along the ellipsoid's surface the slope of the geoid relative to the ellipsoid. By integrating this slope along various arcs the departure of the geoid above and below the ellipsoid of reference can be obtained. Tremendous quantities of data are needed to construct a chart of the geoid for the whole earth, or even for large regions. Furthermore, the technique cannot be applied over the oceans. In the satellite orbit, nature has already done the integrating that the ground-based geodesist must do in depicting the geoid. For the motion of the satellite in its path is the result of the collection of forces operating on the spacecraft, the dominating one being that of the earth's gravity. Thus, the satellite geodesist has in the orbital data a worldwide picture of the geoid, his task being to sift out the different harmonics as an aid to visualizing the structure of the gravity field. The two approaches are in a sense from opposite directions. The ground-based geodesist starts from bits and pieces of the total picture and tries to reconstruct the total from those pieces. In contrast the satellite geodesist starts with an integrated effect and tries to discern from the total what the key building blocks are. Figure 43. Determining the geoid from ground-based measurements. 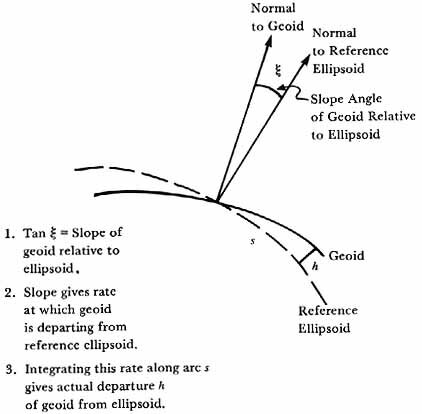 (1) Tan f is the slope of the geoid relative to the reference ellipsoid. (2) The slope gives the rate at which the geoid departs from the ellipsoid as a function of distance along the ellipsoid. (3) Integrating this rate along arc s gives the actual departure h of the geoid from the ellipsoid. ....and a number of the more general coefficients-for example, J22, J31, J32, J33, J41, J43, J44 - had been computed.43 In view of such successes it is natural to ask if satellite geodesy was destined to supplant ground-based geodesy. The answer to this question must be no. just as sounding rockets continued to be essential for upper atmospheric research even after the satellite was available, so ground techniques, the power of which was greatly strengthened by the development of long-baseline interferometry using fixed sources in the sky like pulsars, remained essential to geodesy. In fact, over the years ahead geodesists would be discussing the necessity of combining ground-based and satellite methods to achieve required accuracies. Nevertheless, satellite geodesy injected a remarkable stimulus into the field. By 1964 the world's astronomers were seriously considering  incorporating the new results from satellite geodesy into the international system of astronomical constant.44 As with the magnetosphere, one is led to ask if such actions, along with the impressive results flowing from geodetic research with satellites, did not indicate a scientific revolution in the field. Satellite geodesists could indeed think and speak of their work as "revolutionary." The Vanguard results swept this whole philosophy into limbo. Stress differences clearly existed in the mantle. Isostasy was not true on a large-scale, at least not to the extent demanded by the Basic Hypothesis of Geodesy. Finally it must be noted that the expanded perspective afforded by satellite geodesy applied not only to the earth. The techniques that were proving so useful in the study of the earth would obviously be effective in investigating the moon and planets. Indeed, it was clear that a very long time would elapse before extensive ground-based geodesy could be practiced on another planet. For the foreseeable future satellites would have to be the principal tool of lunar and planetary geodesy. Fortunately circumstances had provided a considerable opportunity to practice with this new tool before lunar and planetary orbiters would be in operation. But there was little time to spare. By the end of 1964 the Lunar Orbiter was getting ready to go. By the middle of the 1960s the sounding rocket and instrumented spacecraft had proved themselves to be revolutionary new tools for  scientific research in the sense that they had made possible investigations and discoveries not possible at the ground. They had allowed men to look back on the planet from a new vantage point in space, enhancing the perspective in which one could view the earth. This perspective would continue to deepen as spacecraft and men reached other planets, making it possible to study the earth not as the only accessible planet but as one of many like objects. Broadly, these investigations might be regarded as normal science. But many scientists considered the impact of space science on both magnetospheric physics and geodesy as revolutionary, especially in the frame-work of the individual discipline. In any event, the degree to which space studies enriched those sciences was inspiration to the scientists and a satisfying return on the investments of the countries that supported the work.